I was asked the other day: "To get 100 seedlings or so from a cross how many flowers do you pollinate on average. And if something turns up that is great do you repeat that cross once more or do you stop there." That really depends on what the track record of the seed parent is like. If I was to use 'Sequoia Ruby' for example, I would need to pollinate maybe 20 or 25 blooms to guarantee 100 seedlings since nearly every seed it makes germinates. So it all depends on the seed parent. Sometimes you have to just guess and hope. I have fallen into a pattern of planning crosses in two year cycles, which is to say that if I want to try a cross and I am very uncertain of its viability, I will just pollinate ten blooms or so and see what happens, If the seeds germinate poorly, or not at all, I don't bother trying to repeat it. Sometimes you look at a large population of seedlings from a cross and you select ten from it and they are all very similar, in which case I wouldn't likely repeat the cross, assuming I got the best it had to offer. If I only got 5 seedlings and they all looked very different and very interesting, I would definitely repeat the cross in larger numbers. 'Gloire des Rosomanes, by Plantier circa 1825 and introduced by Vibert in 1836. It is sometimes listed as a China, a Bourbon or even a primitive Hybrid Perpetual. Fully remontant, relatively disease free in most climates, and a lovely scent. It is a known triploid, and yet contrary to popular mythology it is highly fertile. In fact, it is responsible for numerous hybrids, involved in the pedigree of 7264 unique hybrids to date. 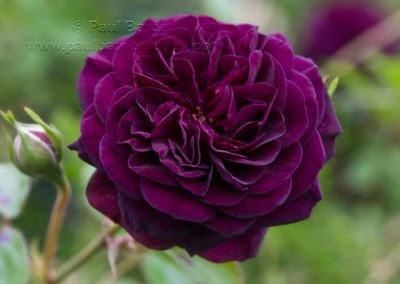 Most of these came down through 'General Jacqueminot', the famous "red" Hybrid Perpetual. Today, I have been slapping 'Gloire des Rosomanes' pollen on numerous plants, to see what variety of results I get using it on modern hybrids. Its the "old dog, new tricks" school of thought. Anyway, very busy day for me, I have been up since 5:30 AM and have been pollinating since 6:30 (through till 12:30 PM!). And now, I must go attend to watering chores. Ta! This seedling is another of my moss shrubs, bred in 2002. It came out of a cross of 'Condoleezza' X "Nutshop", back when 'Condoleezza' was still just an un-named test variety Sequoia had sent to me for evaluation. The pollen parent, "Nutshop" is also a Moore moss shrub bred from ('Schoener's Nutkana' X 'Christopher Stone') X "Orange Moss" and its code number is 25-59-7. It earned the nickname "Nutshop" from Burling Leong and Kim Rupert who found it growing on the Sequoia Nursery property years ago, overgrown by other plants and long forgotten. 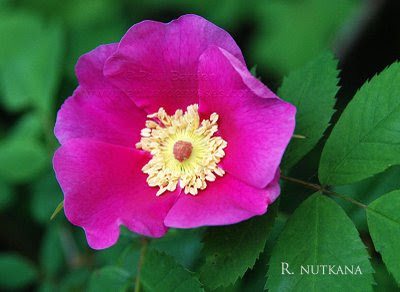 "Nutshop" is a once blooming pink and yellow moss rose, with good shrub architecture and dark, almost black mossing. 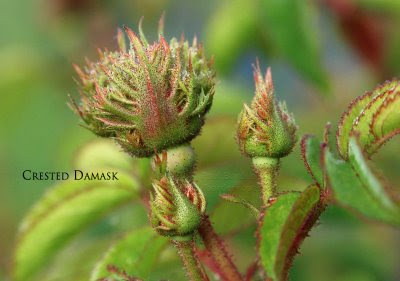 It passes on repeat flowering to many of its offspring if mated with the right rose. I have used it only as a pollen parent, although it does set open pollinated seed. I have been watching 90-02-02 for years now, always hoping it would perform better with each passing year, but I have to conclude that its a dud. It is a low growing plant (under 2 feet) with awkward growth and mediocre, sparse foliage. The mossing is quite good and the buds when half open are a beautiful flame red with a yellow reverse. The blooms have a unique "orange juice-ish" scent that was no doubt inherited from "Orange Moss". 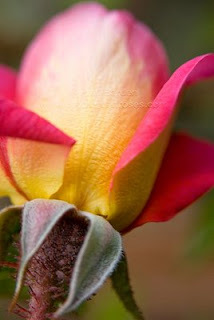 When full open, the blooms fade to a pink and pale yellow combination which unfortunately tend to scorch in the sun. Hence, a dud. However, this cross was only a test cross and only a half dozen seedlings were raised. I don't know why I never pursued it further, since this seedling shows potentially better things might be had from such a cross. This could be an instance where a much better seedling might be had if I grew out 100 seedlings or more to select from, and so I think I will repeat the cross again this year to see if something better might be had. Most hybridizers have their own personalized technique when it comes to collecting and storing pollen, and I'm no exception. Let me describe what I do. The container shown here is a Watchmaker's Case sold by Lee Valley Tools (Item G. on the page at this URL), and this particular size is the 53mm, which comes in an aluminum carrying case holding 15 of the "jars". This particular set costs $11.20 plus shipping and they last indefinitely if cared for. Many people like to reuse containers they already have, which is a fine idea. (Baby Food jars are good, film canisters less so.) However, I have been using these Watchmaker's cases for years and find them to be an ideal tool for the job. As you can see, the pollen sticks to the inside glass of the lid and is easily seen. Any glass container is useful for this same reason but I like the fact that I can carry three boxes of fifteen jars (for a total of 45) and have pretty much every pollen I need available to me at that moment. I gave up using brushes years ago, favoring my fingertips instead, which only require a quick wipe on my shirt to clean before changing pollen. 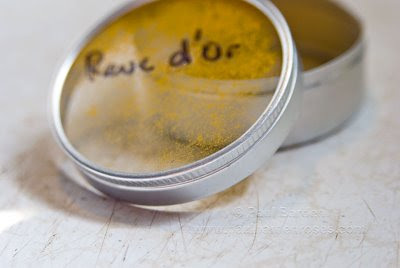 The pollen is very easily taken from the inside of the glass lid of the watchmaker's case for application to the desired stigma(s). If I am done with a particular pollen for the year, I can wash the case and relabel it to collect a new pollen if I want. These are reusable year after year and well worth the initial investment. They are extremely convenient and compact, and provide what I regard as the ideal environment for collecting and storing pollen. Oh, and I also collect pollen in the Fall and dry it in these containers and then into a Ziploc bag in the freezer for use the following Spring. What could be better?! Black Tea, by Kanjiro Okamoto. Just for the sake of publishing a nice image: 'Black Tea' bred by Kanjiro Okamoto of Japan, introduced into commerce in 1973. 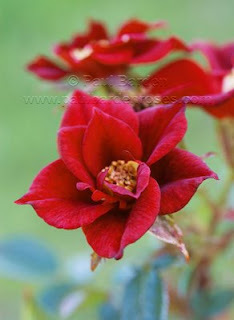 Its a Hybrid Tea, upright, stiff and rather awkward, with plenty of flesh-ripping thorns. 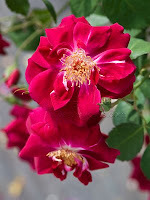 Not a particularly good garden rose, it is grown for its Cinnamon/rust/Chocolate colored blooms which are notoriously difficult to photograph. 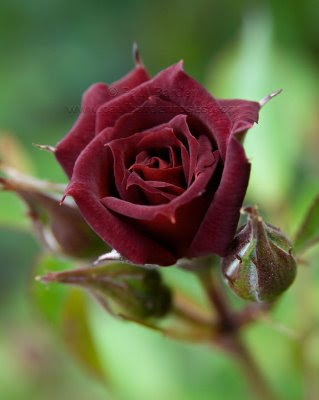 (This photo doesn't quite get it right, but close) This is one of the so-called "brown" roses, an elite group that has become popular within certain circles in recent years. Click on the image to see a larger version. This photo is specially for Carolyn Parker, whose photography is always inspirational. Check out her exquisite book entitled R is For Rose. Coming soon: photos and description of one of my favorite selections from the cross of 'Joycie' X 'Fortune's Double Yellow' made in '06. In the process of preparing pollen for the Spring pollination season, hundreds and hundreds of blooms are torn apart to remove their anthers.I am constantly creating and clearing up multi-hued heaps of petals from my work surfaces. 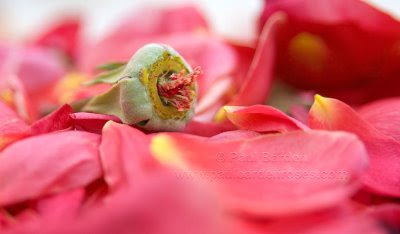 Yesterday I was struck by the delicious range of hues that make up the petals of 'Mons. Tillier', the old Tea. (Whose identity has long been disputed. See Jocelen Janon's recent report) So here, just for your delight, is a photo of said heap of fruit-colored petals and discarded ovary, sans anthers. Back in the 1980's Ralph Moore of California became enchanted by the bizarre Parsley-like sepals of R. centifolia cristata, commonly known as 'Chapeau de Napoleon'. 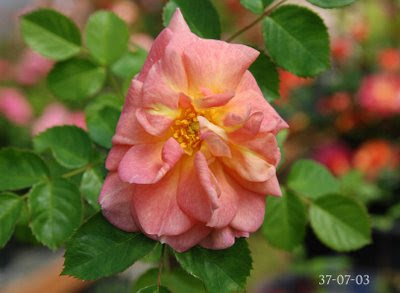 At that time there were no known hybrids from it, and so Ralph set out to accomplish what would be one of the most challenging tasks of his career: to create a Floribunda style modern rose that had sepals like those of 'Chapeau de Napoleon'. As it happens, this was to be a most difficult goal to achieve, and Ralph still did not get as far down that road as he would have liked, even thirty years later. Fast forward to 2000: I collected open pollinated seeds from my 'Crested Jewel' and sowed them the following Spring. I don't recall how many seedlings I got, but only one was kept. When it was a year old it was planted in one of the areas assigned as a test beds, along with thirty or so other seedlings, mostly intermediate hybrids engineered to take me to specific goals. Here the seedling remained until January 2009, when I rediscovered it languishing in back of a group of larger seedlings. I dug it up and put it in a pot and moved it into my main breeding house, where it is about to be put into service. 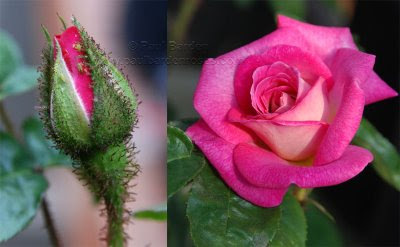 It looks almost identical to 'Crested Jewel', with semi-double medium pink blooms on a tall plant, and moderately intense cresting on its sepals. The big difference though, is that it is fully remontant. It sets seed and so I am presuming it will prove fertile when used with other hybrids. *crosses fingers* Why I never pursued this in breeding is beyond me. I should have tried working with this years ago. I'll post photos of the open blooms in a couple weeks. A question about raising non-remontant seedlings. Today I was asked a question about raising once-blooming (non-remontant) seedlings. "how do you grow your non-recurrent seedlings in pots? 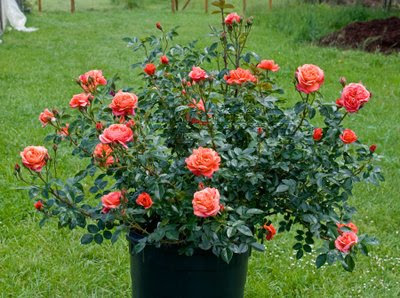 I have more non-recurrent roses coming on than ever, and keeping them in pots would be helpful. Unfortunately, I am not clear on how I can keep the pot size down to something reasonable, how long they should take to bloom, and how to water them." This is a good question. Its a matter of managing space and energy and optimizing the process of maturing seedlings that may take three years or more to start blooming (usually two). Although three years ago I had the garden space to row out non-remontant seedlings as much as I wanted, I am now at capacity in the garden and so I must now grow my selections on in containers. Here's how it works for me: Crosses I make that I know will result in once blooming offspring are potted up into 3" square pots initially and grown on until June, or until they appear ready for potting on. At this time I evaluate the seedlings for health, vigor, architecture and overall attractiveness. 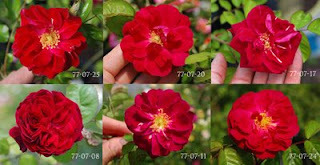 In making this evaluation I try to assess the individual plant's likelihood of exhibiting one or more desirable traits, knowing that selecting for bloom quality/color later on will eliminate many of these. From the 3" pot stage, selected seedlings are moved into 1 gallon black plastic nursery containers where most remain until the following year year. The following Spring, when these seedlings are 12 to 15 months old from germination, most of them will bloom for the first time. Some individuals/crosses may take longer, but the vast majority will flower at this stage. 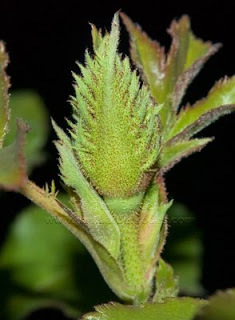 A culling occurs at this first flowering and any plants whose blooms are determined to be inferior will be discarded. The remainder are likely to be moved up into five gallon containers and placed in another greenhouse or outdoors in the open garden for further assessment. Once-blooming selections that are potentially viable on their own merits as commercial shrubs are likely to be planted out directly in the garden from the five gallon stage, as these will need permanent locations to establish them properly. Its getting difficult to find places for these now, but I am culling plants from oen of the test beds every year so locations do open up every Summer. I still do some breeding with Gallicas, with the goal of producing new Gallicas in the traditional style, and these require placement in the garden in order to perform properly. If I've omitted any details in this description, please ask for more information by commenting, thanks. I thought I'd show you a new mini: 58-06-05. This came out of a 2006 cross of Ralph Moore's famous yellow breeder 1-72-1 crosses with 'Hot Cocoa' by Tom Carruth. Only in my wildest dreams did I imagine a miniature with this color intensity would be possible. Now, to be honest, the plant lacks grace (grown in the greenhouse so far, it might look better when moved outside into the open) and the foliage is a bit sparse for my liking. But this is potentially a useful exhibition style variety, since it makes plenty of one-to-a-stem blooms that present well. This seedling also propagates rediculously easily from cuttings. The photo doesn't do it justice, really; the petal texture is more velvety in reality and the color is deeper, richer, more luminous. Its a real "Jocelyn brown" color. Very "oxblood'. I'll be moving this seedling (and its sibling which is similar, but with better foliage and architecture) outdoors soon so I can see how it behaves in the garden. With any luck the plant will take on a more attractive growth habit and the foliage will improve. Yes, this is it; my most untidy breeding greenhouse. Benches built "Ralph Moore style", just 2 X 4 frames with wire mesh surfaces laid on top of construction blocks. It does the job though and it was inexpensive to make. The floor is bare earth covered with black plastic weed control fabric. As you can see, its a metal hoop house with poly stretched over it, also relatively inexpensive. I bought the best grade of poly available because I found I can get at least 8 years use out of it. Everything is watered by hand, although I have the infrastructure available to set up automatic watering if I want. I think this setup is a good compromise between functionality, cost, and durability. If you click on the image and look closely, you can see I have hung a few tags here and there already. (Upper left quadrant: I have pollinated 105-04-08 with a few things) Its far from glamorous, but it gets the job done. As I mentioned in my previous post, I don't use miniatures in my work to breed new miniatures, but to utilize them for some of their other characteristics. It can be a specific trait I am trying to obtain, or some general trait like compact growth habit. In the case of this seedling, I was aiming to capture stripes, as the pollen parent was 'Pinstripe' by Ralph Moore. While I did get a couple of striped seedlings from this group, I am still evaluating them and am unsure of their merit. This seedling, number 07 from the cross of 'Midnight Blue' X 'Pinstripe', has been a rather pleasant surprise. Yes, its a miniature, but a rather unique one I think. In many ways it is a perfect miniature replica of its seed parent except that it has more of a tiny Waterlily bloom form. 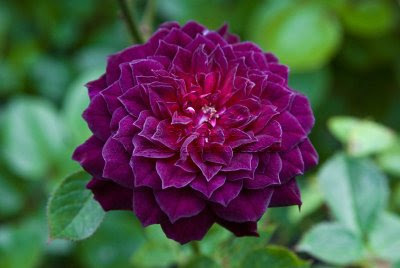 (I regard Tom Carruth's 'Midnight Blue' as a triumph of modern hybridizing in terms of its overall performance and remarkable purple coloring.) 25-07-07 is still only one year old and has not yet matured, so I don't really know much about its ultimate size or shrub form. It appears to be fairly upright but bushy, and it is going to bloom in clusters. 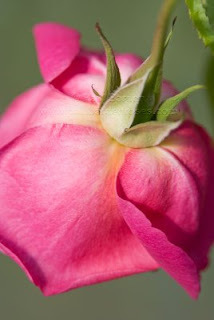 Bloom size is about 1.5" and it has a moderate/strong fragrance reminiscent of its seed parent. (Somewhat Clove-ish) This seedling propagates readily from cuttings as well, which is always a good thing. Busy morning here; I have to go pot up the most recent flush of seedlings while the weather is decent. Looking back to 2002, I was still doing a lot of work with miniatures, breeding more miniatures. (These days I use some miniatures with the intention of creating shrubs of a certain character, not miniatures.) 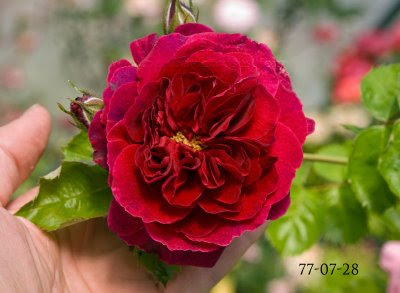 Back in '02 I was using 'June Laver' quite a bit, and this seedling is a cross of 'June Laver' X 'Little Darling', a very "old school" cross. (I mean, who uses 'Little Darling' anymore??!) Still, this turned out to be a very decent seedling. I've watched it for years and it makes a very compact bush about 14" tall, presenting blooms well-placed at the top of the canopy of foliage. No fragrance, of course. 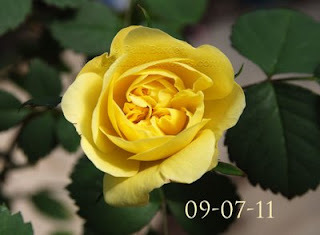 Essentially its a light-medium yellow with a reddish flush mostly at the petal tips. 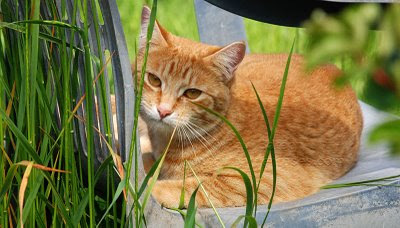 It gets the red blush more in the Spring and Fall and is a clear yellow color in the Summer. 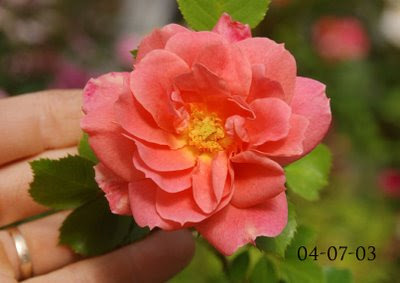 It has exhibition quality bloom form about 80% of the time.